The Serviced Supply Chains project is supporting export development by working closely with specific export chains across Australia to demonstrate the benefits of improving cold chain management. 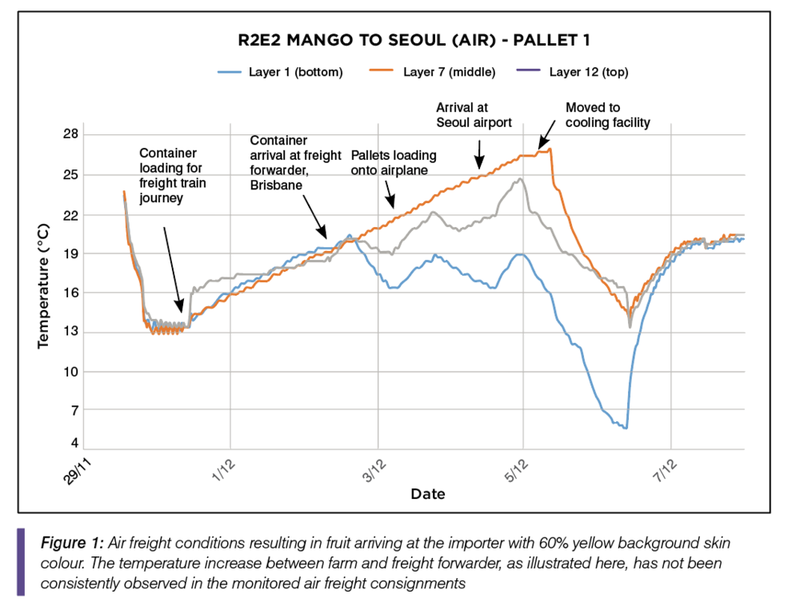 Over the past two seasons, a team from the Department of Agriculture and Fisheries (Queensland) monitored 20 export shipments of Manbulloo R2E2 mangoes to South Korea and China for shipment temperatures and fruit outturn quality of air and sea consignments. Scott Ledger, Quality and Export Manager at Manbulloo said, “We’re trying to deliver mangoes to our importers with enough life to hold and distribute the mangoes to retailers over a five to seven day period and give the retailers five days shelf life to sell the fruit to consumers. To keep our customers happy requires strict control of temperature through the supply chain, and temperature monitoring certainly helps us to keep an eye on what’s happening”. Mangoes require careful temperature management to ensure adequate shelf life. If they’re exposed to warmer than desirable temperatures, the fruit start to ripen. They generate heat as part of the ripening process, which can further increase fruit temperatures, particularly in the middle of the consignment. This often results in more advanced and uneven ripening within the consignment, reducing the shelf life and increasing costs down the chain. To manage ripening, both temperature and duration from harvest to consumption need to be monitored and controlled. Good temperature management is a lot more important with longer times between harvest and consumption, such as with sea freight consignments. Monitoring temperatures and duration through the supply chain identifies those steps where temperatures aren’t managed well enough to maintain fruit quality and value. The tracking of export consignments confirmed the importance of maintaining the recommended storage temperature of mangoes around 12-13 °C. Fruit held at these temperatures arrived with a desired level of ripeness and shelf life. Exposure to periods of handling at 20-24 °C in the air shipments unfortunately resulted in fruit arriving at an advanced ripening stage with limited shelf life. Over the past two seasons, it has become clear that air and sea freight consignments are exposed to differing risks in relation to deviation from ideal temperatures and durations. Air freight consignments typically experience increasing temperatures during the air transportation while sea freight consignment temperatures are typically more stable. However, significant variations in temperature across the load often occurs in both export scenarios. Figure 1 illustrates the increasing temperatures of an air freight consignment from farm to importer, and also the variation in temperature between layers in same pallet. The temperature in the centre of the pallet was higher than in the top or the bottom layer. Figure 2 illustrates the typically better temperature management during sea freight, but also the risks associated with trans-shipping through disruption of the cold chain and increased time for the sea freight journey. “It’s been a great project to better understand and improve our supply chain to maintain the value of fruit destined for Asia” Scott said. Newer PostOn your marks, get set….